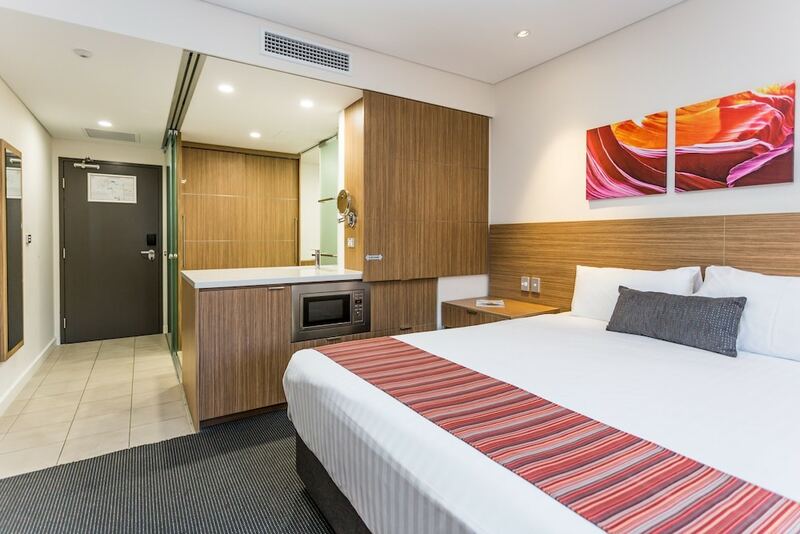 Situated near the airport, this motel is 0.5 mi (0.9 km) from Ascot Racecourse and within 3 mi (5 km) of Crown Perth and Optus Stadium. Belmont Racecourse is 2.9 mi (4.7 km) away. A restaurant, an outdoor pool, and a bar/lounge are available at this smoke-free motel. Free WiFi in public areas is provided, as well as free self parking, a free airport shuttle, and a free manager's reception. Additionally, a coffee shop/café, a spa tub, and a conference center are onsite. All 161 soundproofed rooms provide free WiFi, free wired Internet, and pillowtop beds. Kitchenettes with refrigerators and microwaves are standard, and guests will also find TVs with satellite channels and sofa beds. In addition to an outdoor pool, Country Comfort Perth provides a spa tub and a children's pool. Dining options at the motel include a restaurant and a coffee shop/café. A bar/lounge is on site where guests can unwind with a drink. A complimentary manager's reception is offered each day. A computer station is located on site and wireless Internet access is complimentary. This 3.5-star property offers access to a business center. Event facilities measuring 1076 square feet (100 square meters) include a conference center. This business-friendly motel also offers tour/ticket assistance, barbecue grills, and a garden. A roundtrip airport shuttle is complimentary to guests (available 24 hours). Onsite self parking is complimentary. Country Comfort Perth is a smoke-free property. Firehouse - This restaurant specializes in regional cuisine and serves breakfast, lunch, and dinner. Guests can order drinks at the bar and enjoy alfresco dining (weather permitting). A children's menu is available. Open daily. Start your morning with a continental breakfast, available each day from 6 AM to 9 AM for a surcharge. Every day, the motel hosts a free manager's reception for you to enjoy. You can order a meal from room service during limited hours.